Just starting out and need the basics? 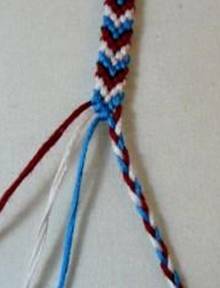 Here are some friendship bracelet instructions that will get you up to speed in no time flat. Embroidery floss typically comes in skeins that are 8 meters (8.7 yards) long. Most patterns require at least 60 inches for each strand. This means that you should be able to cut 5 strands per skein. Unless you are making a very wide or very long bracelet, one skein per color should be enough to make one bracelet. A small craft pillow or old pillow is recommended to use as your “work station”. It should be comfortable enough to sit in your lap and not have any special meaning. 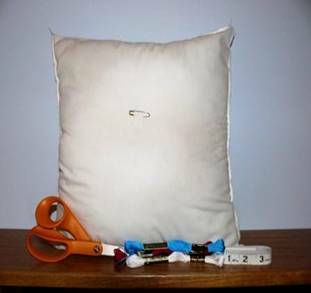 Since a safety pin is used to anchor the threads down, eventually many holes will start to appear in the pillow as you expand your bracelet creations. Alternative travelling workstation. My favorite workstation for making friendship bracelets? My leg! I like using a safety pin to fasten my work to my jeans. No pillow required that way. A 60 inch fabric tape measure is not necessary, a yard stick or other measuring device can be used, but it is strongly suggested. These are the 4 basic knots you'll use for making floss friendship bracelets. The abbreviations (in brackets) should come in handy if you follow patterns - they are commonly used in friendship bracelet instructions. Watch a forward knot video. 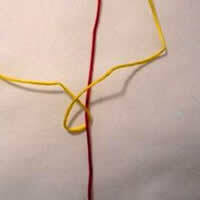 To make a Forward Knot, start with the thread on the left (red). Lay the thread on top of the right thread (white). This should make the number “4”. 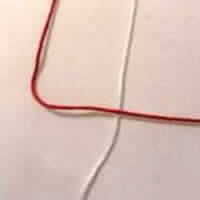 Loop the left thread (red) under the right thread (white) and pull upwards. ** Repeat to finish the knot. The left thread will now be on the right. 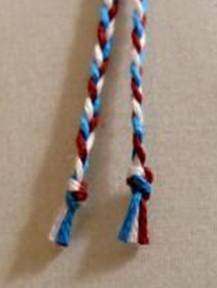 Watch a video showing how to make a backward knot. The Backward Knot starts on the right and moves left. 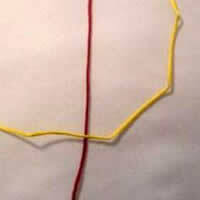 Lay the right thread (yellow) on top of the left (red). Loop the right thread under the left and pull upwards. **Repeat to finish the knot. The right thread will now be on the left. Watch a forward backward knot video to see this in action. Watch a backward-forward knot video to see this knot being made. Once you have decided on the bracelet pattern and color scheme, measure the strands to the desired length and cut. Lay the strands together, lining their centers up. 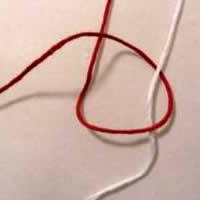 Fold the strands in half and make a knot at the center, leaving a loop approximately ¼ - ½ an inch long. This loop will be used to tie the bracelet when complete. When you have the loop at the length you want it, pull on the strands to make the knot tighter. Lay out the strands in the order the pattern suggests. Try different variations of color patterns to see which looks best to you. You can then begin knotting. After reaching the desired length of your bracelet, separate the strands into 2 equal groups. Braid each group to at least 4 inches and put a knot at the bottom. Pull the strands to tighten the knots. Trim the remaining strands. The braids can be shortened after the bracelet is on the wrist, if they are too long. Note: If you are following a pattern, the pattern may have different friendship bracelet instructions for finishing off. I like this finishing style because I don't have to be too particular about measuring the bracelet length. To fasten on the wrist, lay your wrist on the bracelet. Pull one braid through the loop and tie to the other braid. You are finished! The most important thing to remember when making friendship bracelets is to keep consistent tension on the threads in use. It is a matter of personal preference on how tight you want it, but it should not be too loose, as the bracelet could fall apart. If the bracelet seems too tight, don’t worry. It will loosen after repeated wearings. Remember, the longer and more complex the bracelet pattern, the more thread you will need. Sixty inches per strand is the minimum you will need. Often, you will need a longer strand of one color than another. Leave at least 6 inches for the braids. If your bracelet curls, the knots may be too tight. Even tension is the key - not too tight or too loose. For curling that just won't stop, try ironing lightly using steam, but don't press too too hard with the iron- you'll flatten the knots. Take your time, and don't get frustrated. Practice makes perfect. It is ok if you make a mistake, as long as you detect it quickly. The knots can be taken out. Don’t be afraid to experiment with knots and colors. You never know when a masterpiece might be created! Have fun! I hope you enjoyed these friendship bracelet instructions!